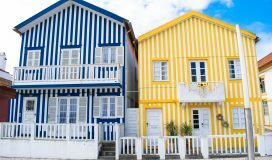 Taking your dog abroad to Portugal or another European country and then bringing them back is pretty straightforward, if you know what you’re doing. If it’s the first time you’ve decided to take your dog on holiday or abroad with you then you really need to read up on what you should do. Simply put, if you miss any of the requirements then your pet will not be allowed to travel or may be quarantined. The dog kennels on the Portsmouth-Santander ferry. Large kennels at the bottom and small at the top. Twice a year my parents would take the Portsmouth-Santander ferry crossing with Brittany Ferries and so are pretty good at getting our dogs ready for travel. So this article is specifically written for people taking their dog from England to Spain/Portugal on the ferry and back. If it is the first time you have taken your dog abroad then I would advise you give yourself at least 2 months prior to travelling in order to get the pet passport and any outstanding vaccinations sorted. It takes away the stress of leaving things to the last minute if there are any complications. One thing to remember is that the requirements for entering Portugal and then returning to the UK are different. Portugal has banned some dog breeds, so read up. What does my dog need when entering a European country? A rabies jab or booster (to be given after the microchip has been fitted and at least 21 days prior to travelling). To prove this the vet will need to put a stamp in the pet passport, which must be time and dated. What does my dog need when returning to the UK? A rabies jab or booster (to be given after the microchip has been fitted and at least 21 days prior to travelling). You will need a stamp on the pet passport from your vet to prove this. 1 tapeworm tablet to be given by the vet between 24 and 120 hours prior to returning to the shores of the UK, that’s between 1 and 5 days before sailing. To prove this the vet will need to put a stamp in the pet passport, which must be time and dated. Your dog will need regular rabies boosters and your vet will advise you of this schedule. From experience we have found that the rabies boosters in the UK are astronomically expensive, so we try and get them done in Portugal before returning. In Portugal we will pay €35 for 2 dogs, but in the UK we will pay £75 per dog for a rabies booster. Where do I even begin? It all seems very complicated! Step one is to call your vets ASAP and make an appointment to get the pet passport arranged. Does your dog already have a microchip? If not, tell your vet and that must be arranged too. Not all vets are certified to give pet passports. Your vet also will advise you on any outstanding vaccinations and give you up to date advice on going abroad. Be prepared for a bit of a dent in the bank account. Our furry members of the family are always expensive, there is no way around it, so expect it. Poppy and Scrappy on the ferry crossing. This is a ‘large’ kennel. How do I get them back home to the UK? You will need to book an appointment with a qualified vet to have a tapeworm tablet administered prior to travelling back to the UK. Do not leave this till the last minute. I strongly advise you book the appointment a week or two in advance of your departure date otherwise the vet might not be able to fit you in. The vet themselves need to give the tablet, not you, and they need to sign and date the pet passport to confirm that. When you get to Immigration Control all they are really interested in is that the pet passport shows that a qualified vet has given the tablet at the right time. And the right time is 1-5 days before the ferry, which is not less than 24 hours of arriving in the UK and not more than 120 hours. So you can’t get the tablet administered and then take the week-long scenic route to the ferry port. What my parents did was have the vets appointment a day before they travelled up to the port at Santander. The sailing from Santander to Portsmouth is about 24 hours so that worked out well for them. Here’s a picture of Dad in the vets in the town of Tondela in Portugal waiting to get their tape worm tablets. He looks excited, doesn’t he? It looks like he’s the one getting the treatment, not the dogs! Smile, Dad! We had an appointment for 9am and just after 10am we were finally out of the vets with two pet passports stamped and two unhappy dogs. Scrappy recently had most of his teeth removed after a bad case of gingivitis, so he was having some major flashbacks and didn’t take too kindly to the vet pushing a tablet into his mouth. Poppy has a typical dog case of vet-phobia, but find me a dog that doesn’t. And now the countdown begins! My parents now have a maximum of 120 hours to arrive at the port in the UK. That means they have 96 hours to reach the boat in Santander, Spain, followed by the 24 hour sailing. What happens if I don’t make it in time? My parents have always made it in time but we’ve heard of people who haven’t. They have had to find another qualified vet in Spain that will give the poor dog another tapeworm tablet. On one trip my parents met one guy on the boat who had to travel back to the UK three days early as there was an emergency back at home. He had to find a qualified vet within an hour and get them to administer a tapeworm tablet. This dog wasn’t in the best of health either, as it had cut its eye while paddling in a river. Here’s a piccie of poor little Tess. What happens when I get to the port? Your dogs microchip will be scanned and the pet passport inspected for the vaccination timestamps. If everything looks okay then you’ll be allowed aboard. My parents had their dogs pet passports checked twice on one occasion. If things don’t tally up then your dog will either not be allowed to travel or they will be quarantined on the other side until things are amended – this will be very costy. What’s the sailing over like with dogs? I’ve written a comprehensive post on this and hopefully you should be able to find everything you need to know there. 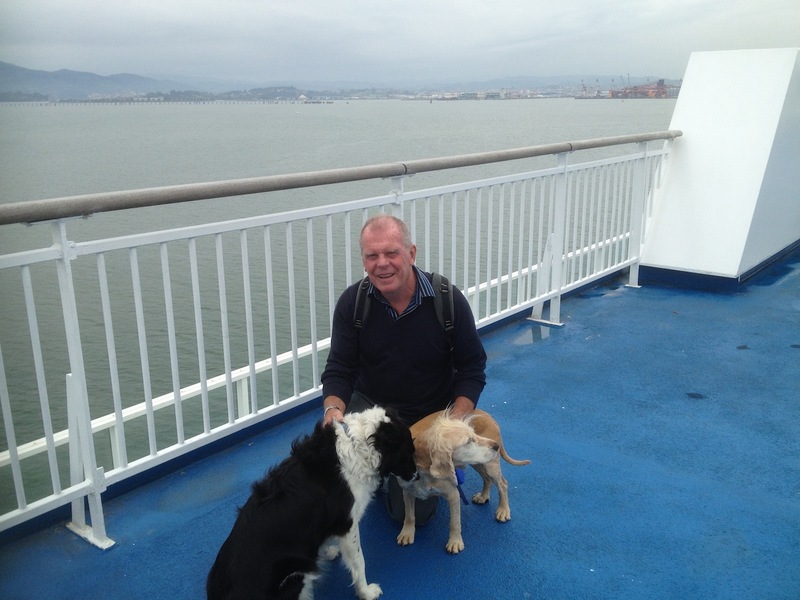 Here’s a photo of my Dad with Poppy and Scrappy as they’re arriving in Portsmouth. What wonderful English weather! They’re on the doggie deck here, which was Deck 10 on their ferry. Dogs are allowed to be off their leads, which we did with Poppy but we kept Scrappy on the lead at all times because he would squeeze through those gaps and be off the side within seconds. That’s it! Don’t forget to have a read on the Government guidelines and read up about the ferry crossing too. Have an enjoyable crossing and I hope my information and insights helped put your mind to ease. Thanks so much for all this straight forward information! You’ve managed to answer loads of my questions regarding travelling with my furry best friend in one well written blog. Thank you! Helpful suggestion, I’m moving with my dog & the checklist is a handy tool! I hope to have a friend and her pup join me at some point and your article was a good reference to share. Thanks for your blog. We’re coming to Portugal with a cat from the US, but the answer I seek probably applies to all circumstances. The Questions: Upon arrival in Lisbon, and provided all is in order with the petpassport, etc., how long does it take to process a pet before the next flight (for example, allow an extra hour?)? Is it obvious where to take the pet to get processed (does Customs direct you to the pet inspection place)?